Facebook has taken another step in his personal competition against Twitter. The past January 16th the company announced the release of the most read topics of the moment, the Trending ones. Currently, this feature is not globally implemented, but it is only available in the U.S., UK, Canada, India and Australia. In addition, this feature is in test for mobile devices’ versions, and probably it will not long before we see it also implemented in apps on smartphones and tablets. The new Trending feature is located at the top of the right sidebar, one of the most visible locations of the page. Unlike the Trending Topcis in Twitter, in Facebook each item is accompanied by a brief description that helps to contextualize the news. In addition, Facebook has no restriction in the number of characters of the news, unlike the 140 characters of Twitter, so you can recreate everything we want in each story. Another important difference between the two social networks is the privacy regarding news. In Twitter all information is public, while in Facebook, the only public information is the one that users have authorized, or the profiles that have activated the follow mode. That makes some news to be Trending in one social network but not in the other. 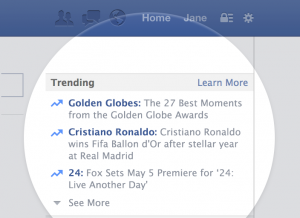 In principle, Facebook should show us less general news but more relevant ones according to our preferences. Facebook has taken another step forward to a new vision of social networks. The company is trying to convince more and more people to use the service in a public profile, the idea to turn Facebook in a place where you can discuss what’s currently happening. However, by the moment, people do not seem to share that view, and most prefer to keep their information and comments private.